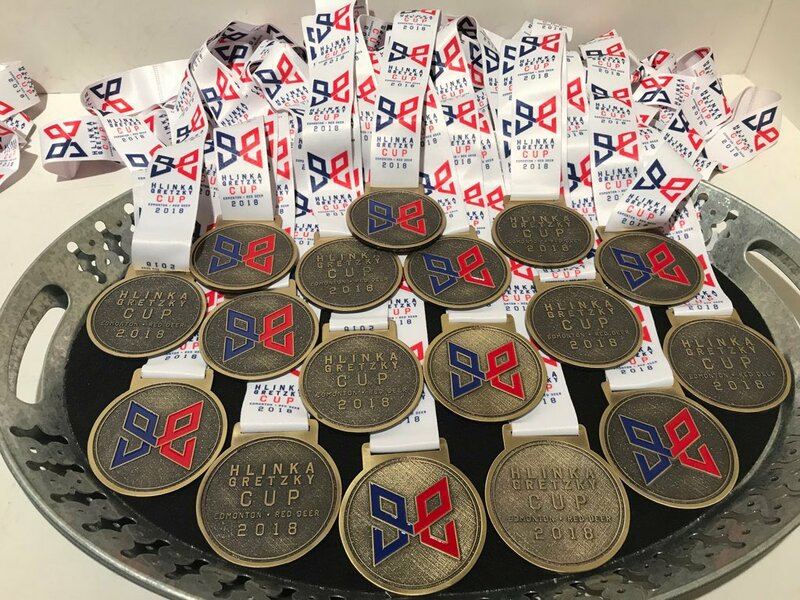 On the final day of the 2017 Ivan Hlinka Memorial Cup, the Czech Republic will attempt to defend its title on home ice against Canada, who will be going for its 21st title in 27 years. In the battle for bronze, Russia takes on Sweden. Canada and the Czech Republic have met in the final of the Ivan Hlinka Memorial Cup on seven previous occasions, with the Canadians winning all seven times. Their most recent encounter in a final was in 2014, when Canada won 6-2 thanks to 3 points from Mitch Marner and 2 goals from Lawson Crouse. The Czech goals were scored by Radek Koblížek and Lukáš Jašek. It was the seventh straight Hlinka title for the Canadians, and they added an eighth straight in 2015, when they beat Sweden in the final 7-3, thanks to 2 first-period goals from Jean-Luc Dubois. In 2016, the Czechs won their first title by beating the Americans 4-3, thanks to to goals from tournament scoring leader Filip Zadina. Now we’re in 2017, and just before the start of the tournament, the Canadians and the Czechs played a pre-tournament exhibition game in Břeclav, with Canada prevailing 3-1 in a physical contest. Both teams finished second in their respective groups - Canada dropping a 4-3 shootout decision to Russia in their Bratislava opener, and the Czechs losing 7-3 to Sweden in their middle game in Břeclav. Then both teams upset the first-placed teams in the crossover semi-finals - Canada beat Sweden 4-1 in Bratislava and the Czechs beat Russia 2-1 before a passionate crowd in Břeclav. The Czechs got goals from Jan Jenik and Jakub Lauko, who have 6 and 4 goals, respectively, in four games. 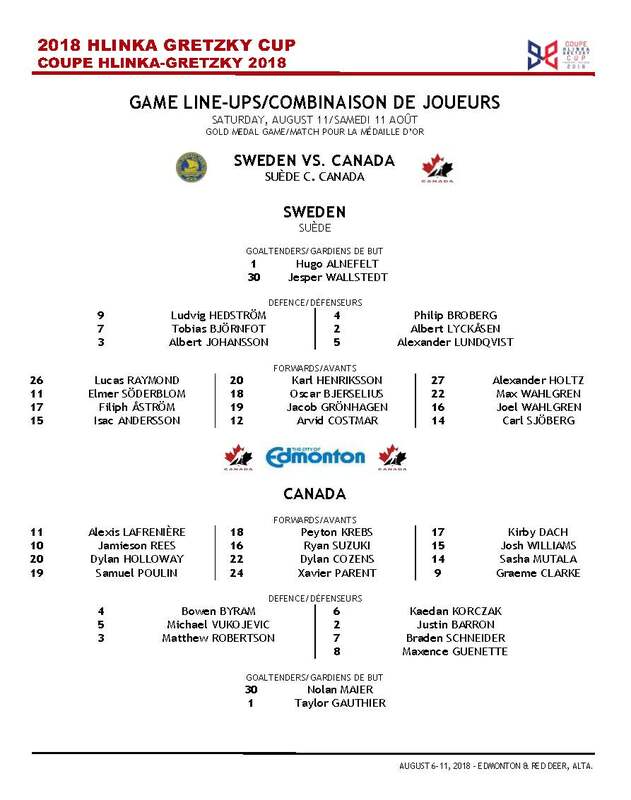 With a strong and balanced roster, Canada has 6 points each from Barrett Hayton, defenceman Calen Addison and captain Joe Veleno. Lukáš Dostál and OIivier Rodrigue were the goalies of record in the semi-finals, and both are expected to start again in the final. Both goalies have won all three games in which they have played this tournament. After winning their respective groups without losing, both the Swedes and Russians had to travel for their semi-finals and lost, meaning that they will battle for the bronze in Bratislava, in a game that will be played at the same time as the final in Břeclav. This is becoming old hat for the Russians, who have taken bronze at the last two editions of the Hlinka Memorial. The last medal for the Swedes was a silver two years ago. "Firstly, the ice wasn´t great,” Russian coach Alexander Zybin began in his post-game assessment of the semi-final. “We got a goal ahead, and then the referees seemed to see the game different. There were times when we had a power play, or should have had one, and ended up playing shorthanded. The Czechs had one player who was good, the rest just stayed in their positions. We weren´t good, they just put the puck into the neutral zone and we didn´t use it." The two teams feature two of the more prominent names of this tournament. The leading scorer is Russia’s Dmitri Zavgorodny, who has 4 goals and 5 assists for 9 points. The tournament assists leader is Swedish defenceman Adam Boqvist, who is also tied for the points lead among defenceman with Canada’s Addison. It should be noted that neither Zavgorodny nor Boqvist figured in the scoring of their respective teams’ semi-final defeats.